It’s August, the official vacation month of the year. So as I think of future travel and its infinite possibilities, high on my list would be a languorous stay in Italy. What better way to experience a place than to be a homeowner, even if temporarily. One of the benefits of authoring this site is the talented people I meet such as reader Katharina Allès Trauttmandorff and her impressive business, Trust & Travel. No ordinary travel agency, Trust & Travel brings history to life with a portfolio of Italian properties with distinguished pasts. 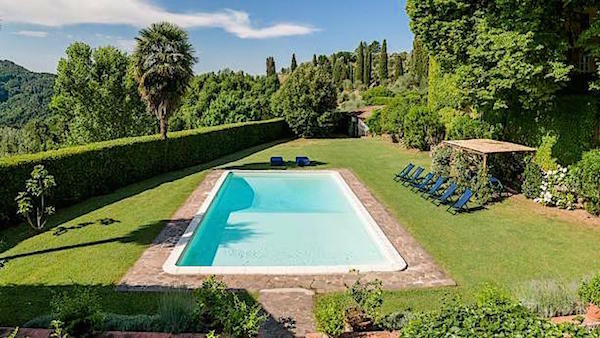 After working in the 1990’s on the wine estate of La Foce in Tuscany, below, Katharina was asked by the owner if she could help him transform part of it into a holiday rental home. She not only supervised the entire project but found him his first clients. Word spread, other estate owners called on her to help restore and convert their properties and in a few years Trust & Travel was born. Many of the estates continue to function as ancestral family homes or agricultural domains, while others may produce fine wine or olive oil or have legendary art collections. 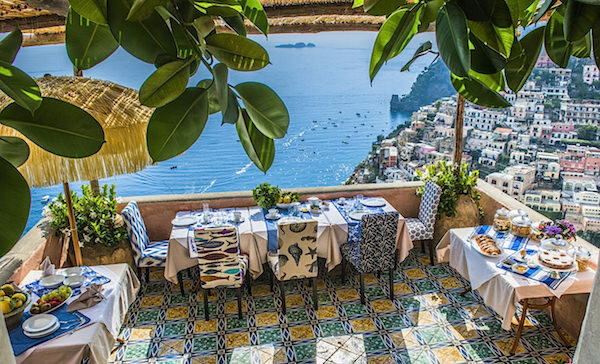 But all have exceptional locations, professional and service-minded owners and provide authentic behind-the-scenes looks at Italian life. Each estate is personally vetted to be sure it meets Trust & Travel’s high standards of comfort, elegance and service as well as local charm and individuality. And by helping to sustain these historic properties, they are also helping the local economy by generating work for local artisans, cooks, designers and more. 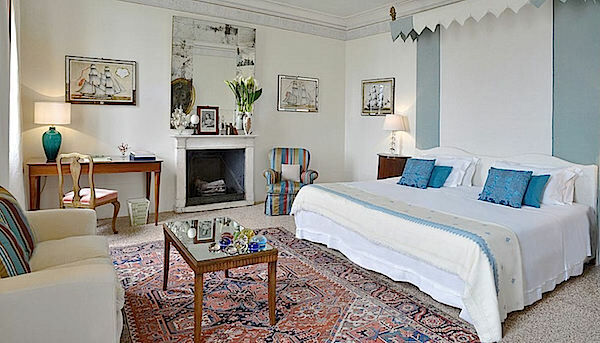 Take for example, Villa Spada, in the images above. 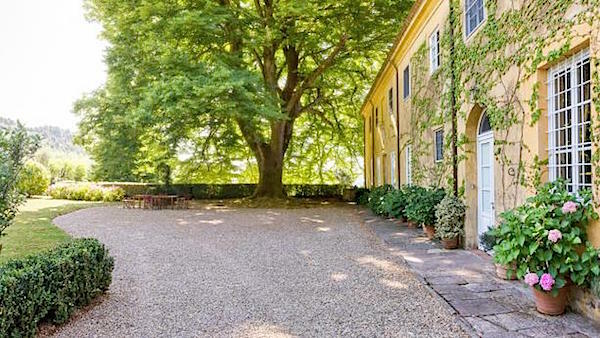 Set in the hills northwest of Lucca in Tuscany, the house dates to the 1700’s when it was the Spada family’s hunting lodge. As with all the villas, in-house meals, tailor-made guided tours and local activities can be arranged by Trust & Travel. 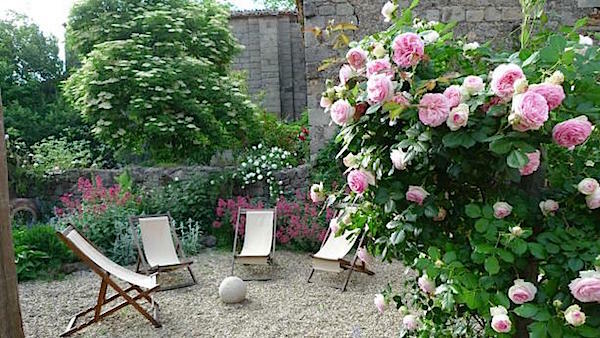 Quite a few of the properties, including the charming Casa di Pietro, above and below, welcome dogs. In fact the properties can be searched with a variety of considerations such as those which have pools, are near the beach, have cook and/or household help and welcome dogs. 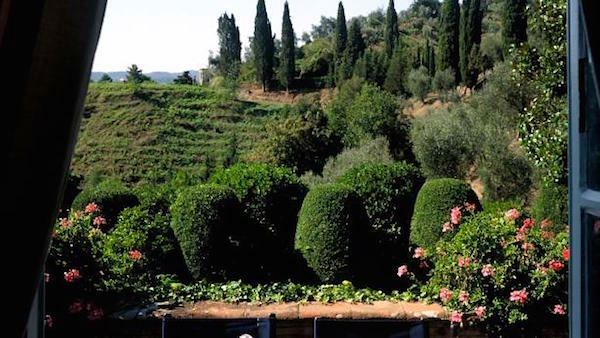 Local vineyard tours and Brunello di Montalcino wine tastings as well as pizza making on a local organic Tuscan farm are a few of the activities that can be arranged from the villa. Expanding on the success of Trust & Travel, Excellence Villas was Katharina’s next venture. 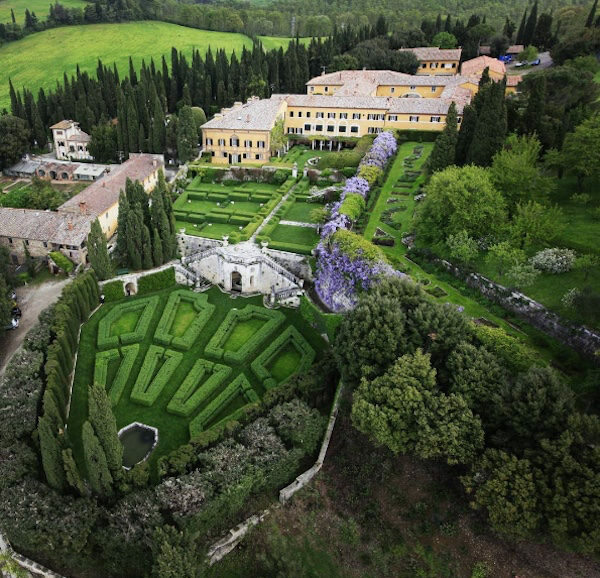 Directed exclusively at a discriminating clientele interested in world-class luxury residences in Italy, these offerings represent Italy at its very best. 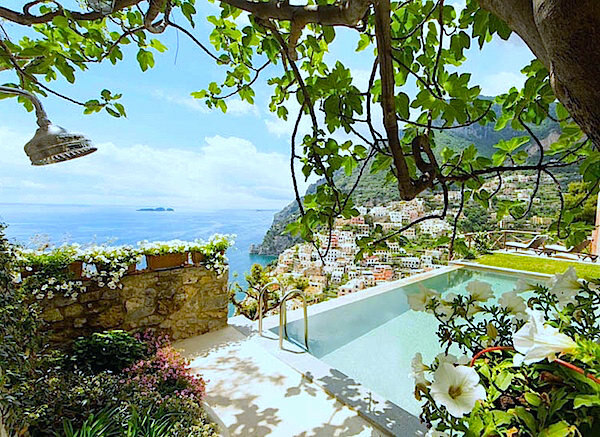 Villa Andres in Positano, the photos above and below, is one the of most exclusive staffed villas on the Amalfi Coast. 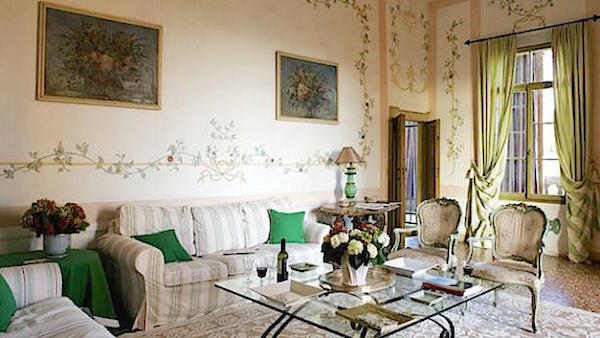 Dating from 1741, guests stay in rooms decorated with frescoes and filled with exquisite antiques and period paintings. Including hand-picked, thoroughly inspected world-class villas or city apartments, Excellence Villas feature outstanding locations, impeccable service, personalized attention, and state-of-the-art amenities, all with the same warmth, hospitality and authenticity which were already hallmarks of Trust & Travel. Katharina and her team are intimately acquainted with each listing, regularly visiting every location to work with the owners and maintain quality control. 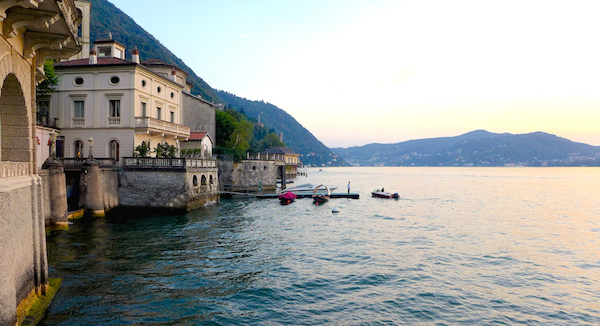 Live large on Lake Como at Villa dell’Imperatrice, above and below. 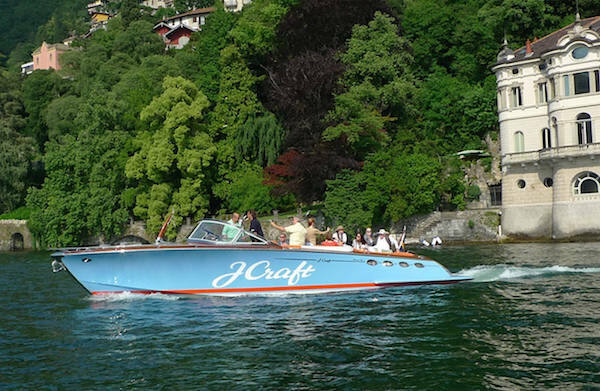 Arrive by car or water taxi at the villa’s private dock, where the courtesy boat can take you to other lake locations. and the generous living room features two fireplaces and Murano chandeliers. 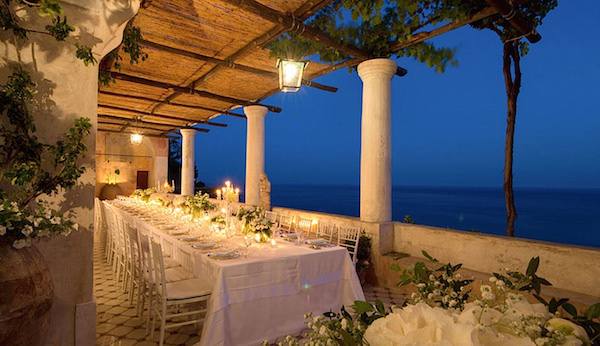 Perfect for a wedding would be Villa Emo Capodilista, above and below, one of Italy’s most beautiful historic villas. 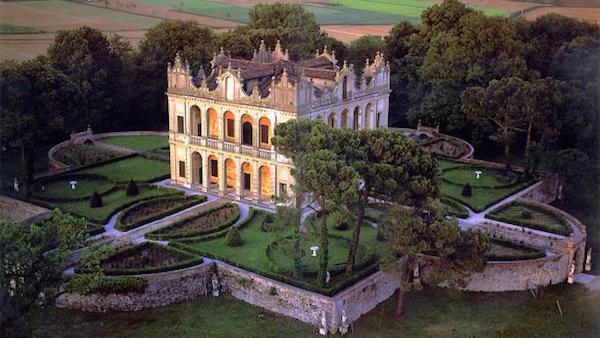 An hour from Venice and 15 minutes from Padua, the villa dates back to the 1500’s when it was the hunting lodge of the Capoldilista family. 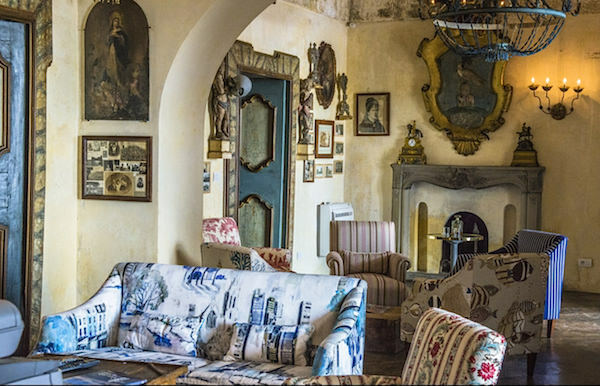 Originally decorated by Dario Varotari, a pupil of Veronese, it was fully restored in 2008, featuring the work of Italian interior designer Anna Guarini. Never interested in resting on her laurels, Katharina has recently unveiled another exciting new introduction. 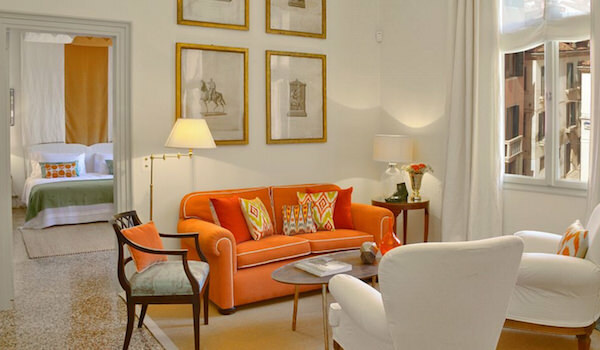 When Marchesi Alberto and Barbara Berlingieri, the owners of a historic 12th century residence in Venice, lived in by the same family for two centuries, were looking to refurbish and selectively rent their exquisite Palazzo Ca’nova apartments, apricot colored building below middle, they enlisted the expertise of Katharina and Excellence Villas. In looking for a partner for the extensive renovation of the historic location, Katharina then enlisted the help of designer Anna Guarini, who commissioned a team of exceptionally skilled local artisans and decorators to complete the work. Complementing each other perfectly, the two found an elegant solution resulting in a combination of classical style with a modern twist. 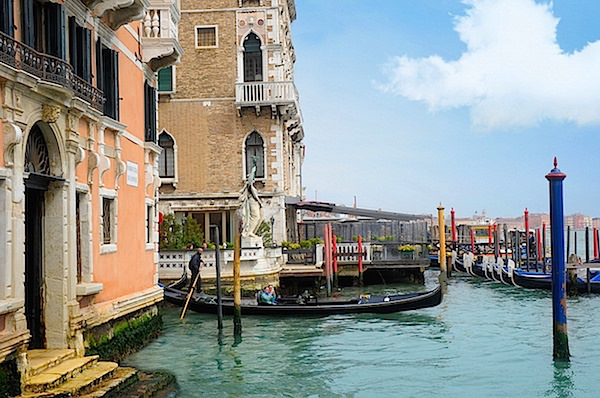 Located at the mouth of the Grand Canal, Palazzo Ca’Nova can be reached by gondola, above. Inside, original features such as beautiful terrazzo floors and generations-old wooden doors are updated with a palette inspired by the 18th century frescoes by Tiepolo. The dining room of the two bedroom Hayez apartment, above, includes chairs that were designed for the Palazzo in 1827 and the sitting room, below, has engravings that have been in the Palazzo for 200 years. 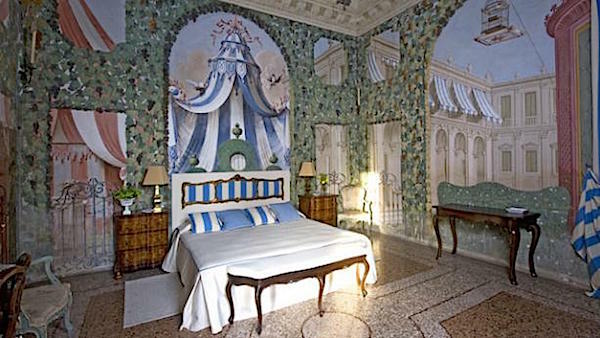 The master bedroom canopy, designed by Guarini, was inspired by a Carpaccio painting which hangs in the Accademia and from frescoes in the lovely Villa Emo Capodilista near Padua, featured previously. The second bedroom features the same fresh colorway. 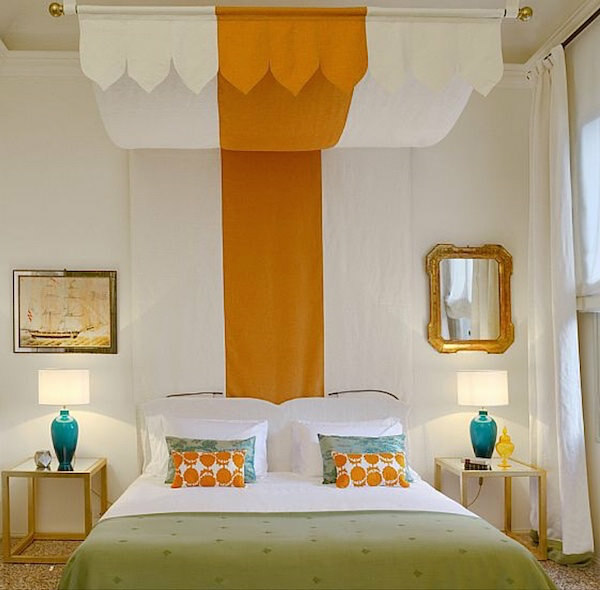 The curtains are of fabric from Lin de France and the beds are the same used in the Four Seasons around the world. 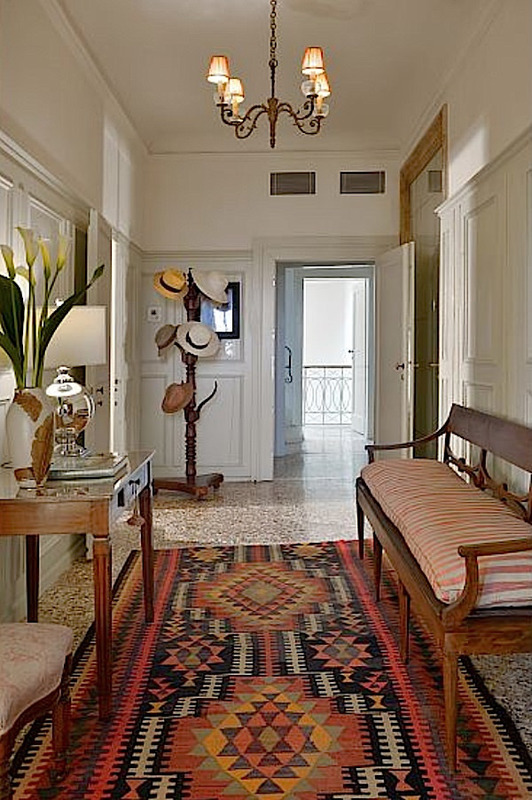 The two bedroom Borsato apartment, like the Hayez, features exceptional views over the Grand Canal. 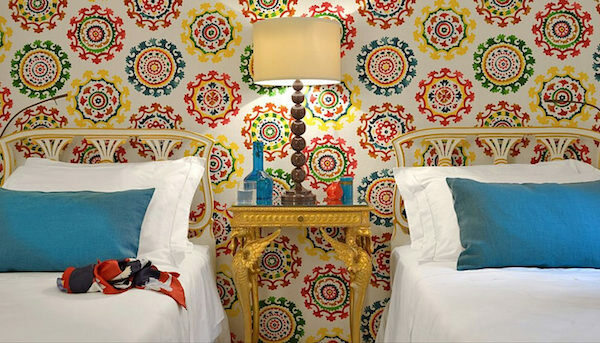 With eclectic furnishings mixing antiques from the Palazzo with lively textiles and pattern, the apartment is spacious and welcoming. An elegant master bedroom with the same canopy treatment is airy and elegant. 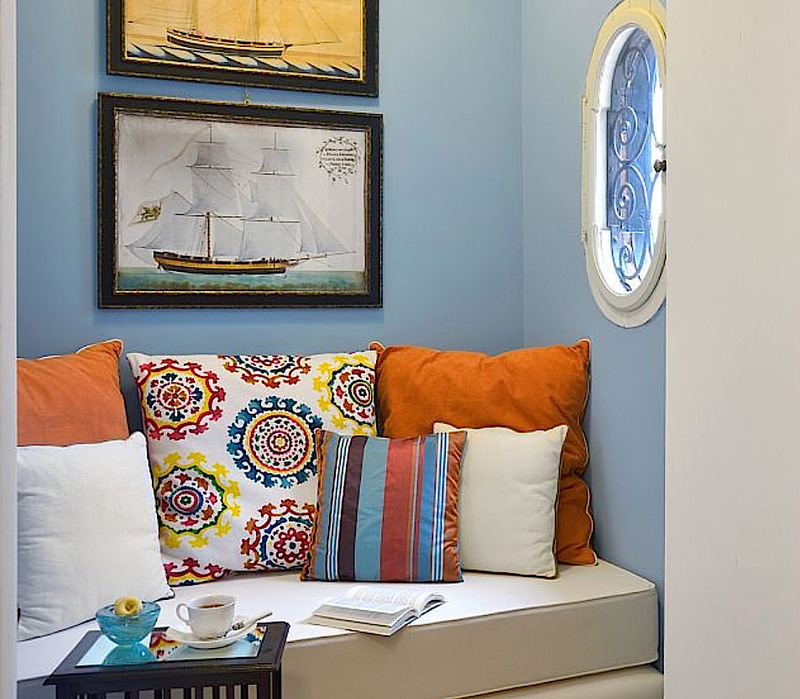 has a charming blue reading alcove, with art referencing Venice’s boating tradition. 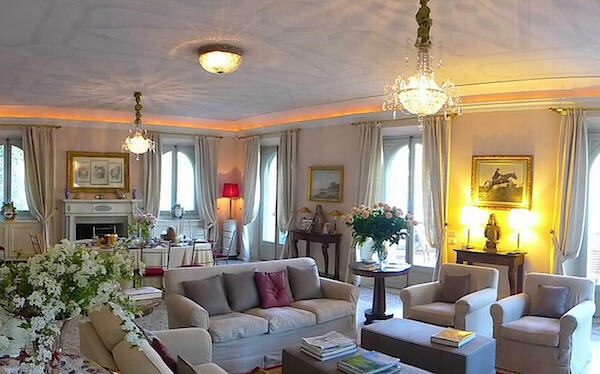 Both apartments include daily maid service, access to a terrace shared by all guests of the Palazzo, as well as a private secretary, ready to help with pointers and insider access. 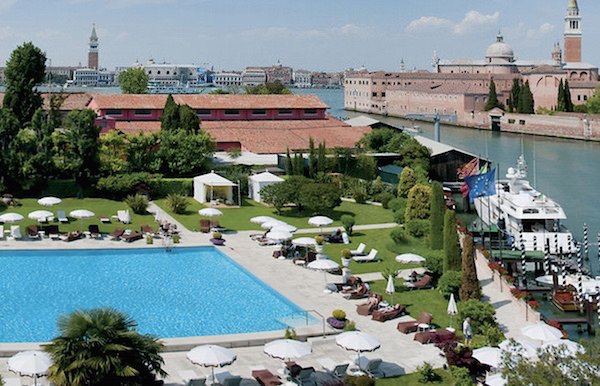 Rental includes exclusive access to the pool at the Cipriani hotel, below, and the Excelsior beach club on the Lido. 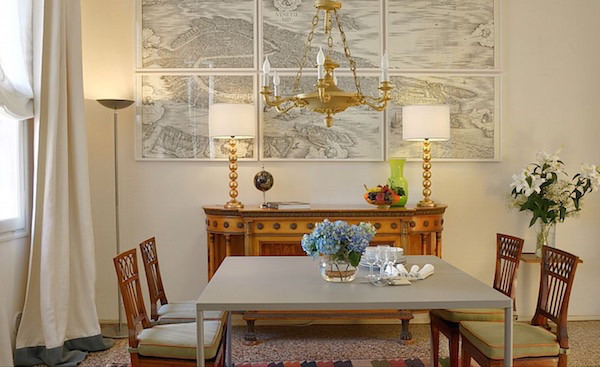 With an exceptional location, steps from Piazza San Marco and the new Punta dell Dogana museum, the newly renovated apartments in Palazzo Ca’Nova couldn’t be more centrally located yet are totally private and removed. 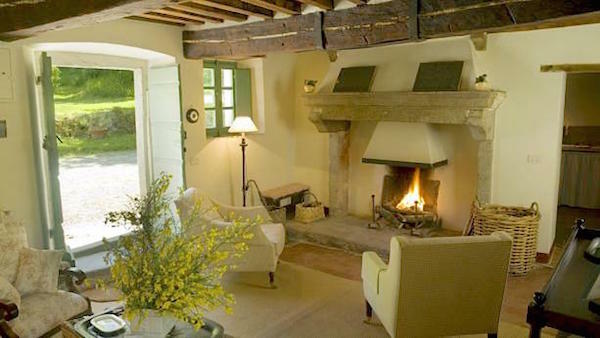 Bridging the centuries, they let you live with history in comfort and luxury. I look forward to Katharina’s next project, hoping for another beautiful collaboration harnessing Anna’s artistic talents. This entry posted in architecture, interior design, travel. 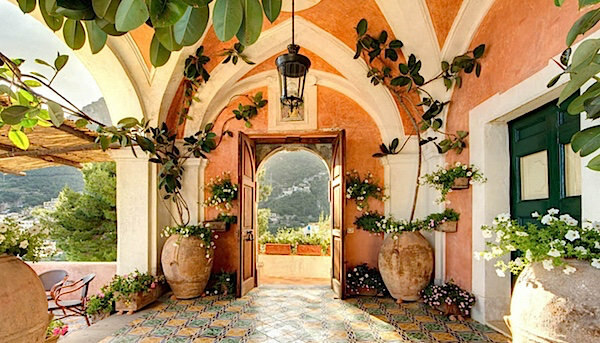 Entry Tags: Excellence Villas, Italian villa rentals, Italy, Travel, Trust & Travel Bookmark the permalink. Should I ever make it to Italy, Stacey, I will no doubt refer back to your exquisite photos and suggestions as to where to stay. 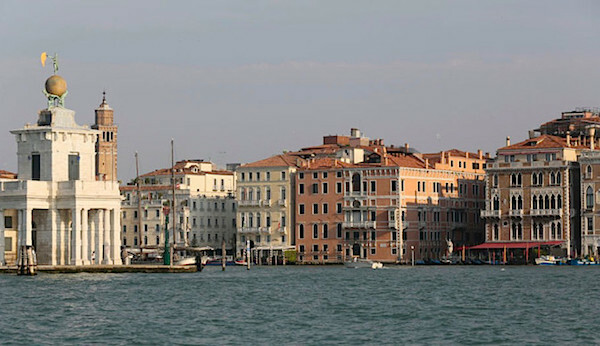 I have thoroughly enjoyed all your blogs on Nantucket as well as this one on Italy. Through your words and photos, I feel lured to visit each suggested destination. Thank you for the inspiration. 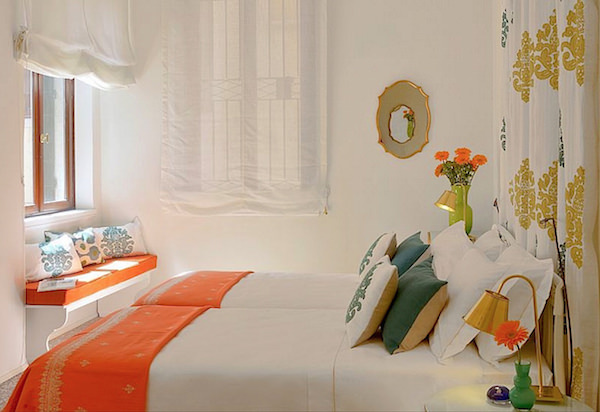 The Venetian apartments are simply drop-dead chic…and such wonderful color combinations! And the Cipriani pool, and Lido beach! What more could anyone want!! Such a beautiful post on Italy! On my bucket list for next year. Also, I have enjoyed all your posts on Nantucket. I leave next Monday morning for Nantucket for a week long visit. YEAH!! This will undoubtedly be my next travel stop to Italy. Truly. Such a lovely images! I will love a trip to Italy! 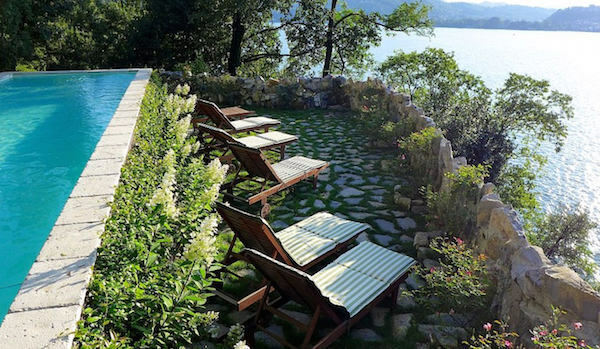 Katharina’ s EXCELLENCE VILLAS will be my first call when planning my return to Como & the Almalfi Coast. So enchanted by my first stay I was reluctant to leave. Truly exquisite post Stacey! This is a fabulous resource . The spots you have chosen are truly amazing . Magnificent Stacey! Thank you for sharing this wonderful resource with us. 80 queries in 2.020 seconds.